Volney Moore House | Waukesha Preservation Alliance, Inc. This Italianate house with its massive tower was built in 1877 for homeopathic physician Volney Moore. In addition to wonderful exterior details, the interior has plaster medallions, pocket doors, and original staircases. The tower originally had a third story on it, but that story was dismantled to use the brick to build Jimmy’s Grotto Pizza stand next to the house. Jimmy’s Grotto now has a building across the street and the original pizza stand was demolished. The Volney Moore house has sat vacant since about 2004. The previous owners started some work on the interior, but the house went through foreclosure proceedings and is currently owned by the bank which is trying to sell it. A dedicated group of volunteers has been cleaning up and monitoring the Volney Moore house. It became clear that the harsh winter was taking its toll on the building. So, WPA started searching for someone to assess the structure and come up with a stabilization plan. Milwaukee Preservation Alliance, Inc. answered our search by contacting preservation architect Donna Weiss. Donna came out and looked over the entire building. She then contacted Marion Restoration in Chicago. 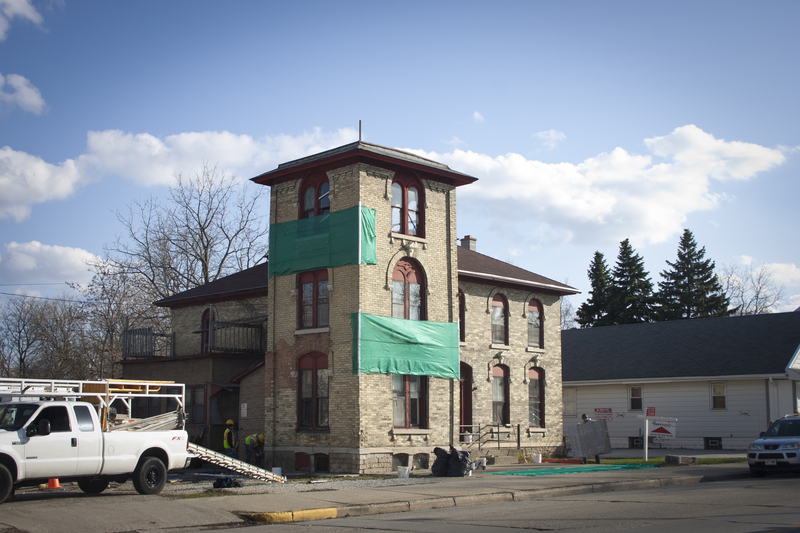 In February, Mario Machnicki from Marion Restoration, Donna Weiss, assistant Josett Katcha, and members of the Waukesha Preservation Alliance met at the house to evaluate the scope of work for the immediate stabilization of the tower. The work was partially paid for by the Arizona bank that owns the property and the rest was a generous donation of their services from Marion Restoration and Donna Weiss. It is not pretty but it will stabilize the building until a new owner takes possession and can do more permanent repairs. Additional photos are available in our gallery on our Facebook page. 05-09-2013 UPDATE: The Volney Moore house has officially been sold. The closing happened earlier this week. It is bittersweet for the volunteers that took care of the property. This house really intrigued all of us. There are secret rooms and interesting features throughout the home. I was still finding new things every time I went in there. The WPA met with the new owner and has offered to assist him as he brings this building back to its former glory.